There were a decent number of Super Late Models that took the green on Saturday night at Montgomery Motor Speedway. A total of 21 racecars were on hand for the third BAMA Super Series race of the year. Unfortunately, 10 of the 21 cars were knocked out of the event or heavily damaged in an accident in the first 100 yards of the 125-lap event. “We had it cleared, but it was our fault for starting that far in the back,” said Enfinger, who started 16th in the 21-car field after collecting a top-five finish in the last Montgomery race. “But someone up around the front of the pack spun out or something. We had all the cars cleared but someone came down and got us from the side. We then hit the wall a ton. It shortened it up about three feet. We’ve got a lot of work ahead of us. Hopefully, it didn’t hurt the motor. For Hornsby, it was another week of disappointment. “I don’t know what happened,” said Hornsby, who ultimately finished 18th. “It looked like someone just didn’t go and turned sideways. It was a big wreck from there. 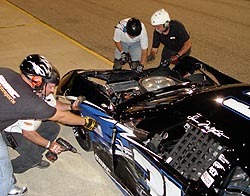 Shaun McWhorter's crew goes to work to fix his ride. know is someone coming across the race track I guess to get us in the right front. Matt Hawkins is quickly learning his way around the short tracks and after having competed in only his 18th start came up one lap short of picking up his first victory. “Right before the pit stops, everyone was dropping off bad. I got by Hogan and Bradberry and a bunch of them. I wasn’t even running the car hard. I thought if we put some tires on this thing, we’ll be pretty good. “Then, we came down the back stretch and pit road was closed and a bunch of guys pitted, but me and (eventual race winner) Augie Grill and a coupe of others stayed out. They let some of the other guys like (Jason) Hogan and others pit. They never gave them a penalty or anything, so I had to pass some of them twice. “I wasn’t very happy about that and I’m still not. I think we might have had something for second-place and maybe even the win if we got there. Whatever. We finished third. We are probably second points down here now. We’ll just keep taking what we can get. Running in your home state is suppose to be fun. However, someone forgot to tell Charlie Bradberry that. For the second-straight BAMA Super Series race, Bradberry earned the pole position, but failed to finish the race. 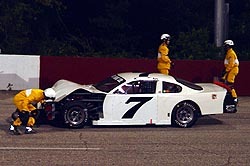 This time, Bradberry fought an ill-handling car all race long and eventually just parked it by the end of the race. It was a tough pill to swallow for the Alabama-native considering the team worked hours upon hours to finish up a brand new car to take to Montgomery. “We wanted to win in the first time out with this car,” said Bradberry. “We were good in practice. We had a good qualifying lap, but we couldn’t get the car to work right in the race. The car wasn’t outstanding, but it was good enough for a top three or maybe a win. must have run something over. Finally, it got worse and worse and I was basically stopping on the track just to get the car to turn in the corners. Was Ken McFarland mad after the race on Saturday night? Sure. Who wouldn’t be? He showed it too by coming around the track and driving right up to the side of race winner Augie Grill’s car during the cool down laps, rubbing him just a little bit, before heading back to the pits to load up his sixth-place car and head back home. But on the track is where it ended for McFarland. “What happens on the track stays on the track,” McFarland told Frankie Grill after the race as the two talked about the contact between McFarland and Frankie’s son Augie that might have cost McFarland a shot at the win. It all started when the fourth-place qualifier Johnny Brazier spun his tires coming to the green and got very loose, lightly bouncing off of the outside wall. As Brazier slowed and tried to gather the car up, the rest of the field was coming up to speed behind him and a huge stack-up ensued. There was plenty of chaos behind Brazier. Included in the accident were the cars of Regan Baker, Danny Bagwell, Shaun McWhorter, John Bolen, Keith Cahela, Chad Braun, Chris Hornsby, Grant Enfinger, DuWayne Middlebrooks and Roger Cain. Baker, Bagwell and McWhorter all returned to the track as the green flag flew again. Bolen was able to make it back out to make a few laps and gain a few spots. 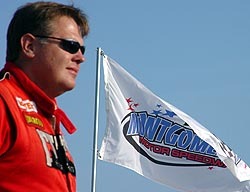 On Saturday night, Musgrave added to his continued good runs at Montgomery with his second-straight third-place finish. “The race went pretty good,” added Musgrave. “We qualified sixth and just rode along there at the beginning of the race to try and save the left side tires as much as we could for the second after you change the rights. You don’t want to abuse them too bad. Johnny Brazier made it through the first lap chaos on Saturday night and ran in the top-five for a bunch of laps, but his car fell off and fell off quick after that. “The car just fell off. It got real loose on me,” said Brazier, a former Southeast Series regular. “This place eats tires up. After the tires go, it was gone from there. The left rear was gone, so putting right sides on it didn’t help it. “If your left rear is still good when you put rights on, you can still go. We’d burnt it up tonight. McFarland has proved to be one of the best at Montgomery this year. “The car was good. The last time we were here, the car was really good. I knew we had a good car this time. We didn’t qualify very well, but I knew the car would be good during the race. The car did exactly what we hoped this car would do. I turned well in the center of the corner. That is where we made up our time. Hawkins qualified his No. 22 in the fifth. Hawkins maintained his top-five positioning, but slid as far back as eighth place following pit stops. 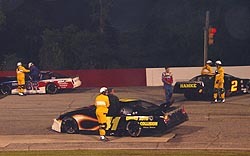 He quickly made his way to the second position and rode there until the leader decided to make their pit stop, moving Hawkins into the lead on lap 91. He and Grill battled side by side for the last three to four laps, with Hawkins holding his own on older tires. He held the top spot until lap 124 when Grill gave him a slight nudge and moved past to take the win. “I’m just ecstatic to have run second,” Hawkins said. “To have missed all of the first practice and most of the second practice due to a mechanical problem, and come back and run as well as we did, we have nothing to hang our heads about for finishing second. The car ran really well. 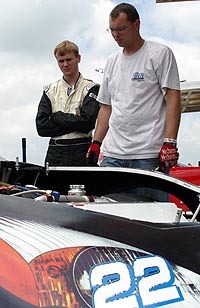 Matt Hawkins (left) and crew chief Jody Wilkerson look over the engine that plagued them in practice. 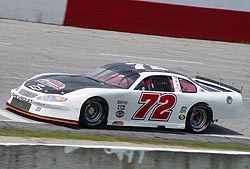 Ted Musgrave Jr.’s home track is Concord Motorsport Park in Concord, NC. However, look at the point standings for Concord and Montgomery Motor Speedway in Alabama, and you might just wonder. At Concord, after two Big 10 Series races, Musgrave sits outside the top-10 in points. At Montgomery, 400-plus miles away from his North Carolina home, Musgrave is now tied for second in the point standings, just seven points out of first. “I like this place,” said Musgrave Jr. “I ran down here with the Southern All Stars a few years ago. I think my worst finish here now is seventh. I like the place. The tires where out and the drivers have to drive the cars more. Our motor is also down some power, but it takes a likening to this place. 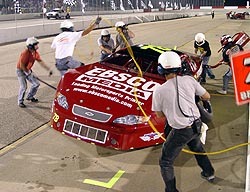 Charlie Bradberry's team changes his flat right rear on the team's first pit stop.